Texas counties large and small saw substantial voter turnout on the first day of early voting for the 2018 midterm elections. The state's largest counties all saw much larger first-day turnout than they did in the previous midterm elections in 2014. Dallas County’s combined in-person and mail-in votes topped out at 55,384 on Monday, almost 26,000 more than were cast in 2014, according to The Dallas Morning News. About 15.8 million Texans are registered to vote in this year’s midterm elections, according to the Texas Secretary of State’s website. 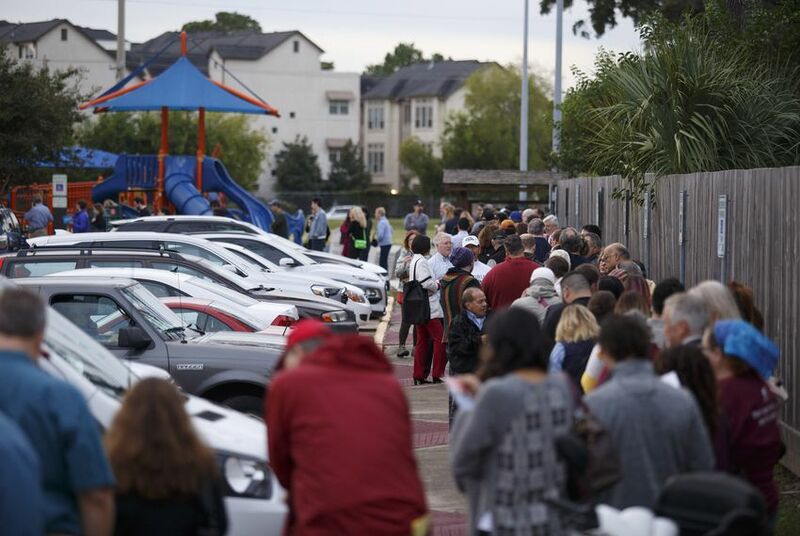 “It’s very impressive for a state that hasn’t done real well in voter registration and turnout,” said Renée Cross, senior director for the Hobby School of Public Affairs at the University of Houston, of the first-day numbers. Cross credits passion from both Republicans and Democrats this election cycle as reason for record turnout. U.S. Rep. Beto O'Rourke, the Democrat challenging U.S. Sen. Ted Cruz, spent the day crisscrossing the Houston area to lead groups of supporters to the polls. The early vote push began before the sun was fully up, with O'Rourke making a 7 a.m. stop in central Houston. More than 63,000 in-person votes were cast in Harris County, The Houston Chronicle reported, compared to 20,215 in 2014. "This is our moment, this is our chance," O'Rourke told the crowd assembled across the street from the polling place. "This is our message to the people of the future. While we can still get it right, we stood up to be counted and we did." Some supporters had been waiting to vote early at the site longer than others. Among them: a group that had camped out in a tent with "BETO" written on it to ensure they would be among the first to vote Monday morning. O'Rourke briefly ducked into the tent and spoke with the supporters. In El Paso County, O'Rourke's home county, a record 17,131 voters turned out Monday as of 7 p.m., said Melissa Rosales, the county's elections information and resource coordinator. Rosales said this year’s high turnout could have been attributed to excitement surrounding O’Rourke and traction from social media. The increased enthusiasm came with some hiccups. U.S. Rep. Joaquin Castro and state Sen. José Menéndez, both San Antonio Democrats, held a news conference Monday afternoon to decry reported problems with early voting. At some polling locations, election workers were understaffed and overwhelmed by the turnout, leading to long wait times, Castro said. At one polling location, he said, a system glitch had forced workers to write information for voters by hand rather than rely on a printer to do the job. Cross said first-day early voting numbers could be indicative of the high number of voter registrations Democrats have garnered this election season in hopes of a "blue wave" giving them control of Congress. However, Cross said it is still too early to tell what the outcome will be on Election Day. Cassi Pollock and Patrick Svitek contributed to this report. Disclosure: The University of Houston has been a financial supporter of The Texas Tribune, a nonprofit, nonpartisan news organization that is funded in part by donations from members, foundations and corporate sponsors. Financial supporters play no role in the Tribune's journalism. Find a complete list of them here.